Dr. Jonathan Fialkow, a Miami-based cardiologist, is not only a man of science, he also has a minor in art history, something which he attributes his design aesthetic to. He’s also an artist in his own right—a photographer—who does his own processing and printing. Fialkow uses art to add pops of color to the walls of his monochromatic office to warm up the space for patients and employees. He selects art for his practice that “starts a conversation,” he says. 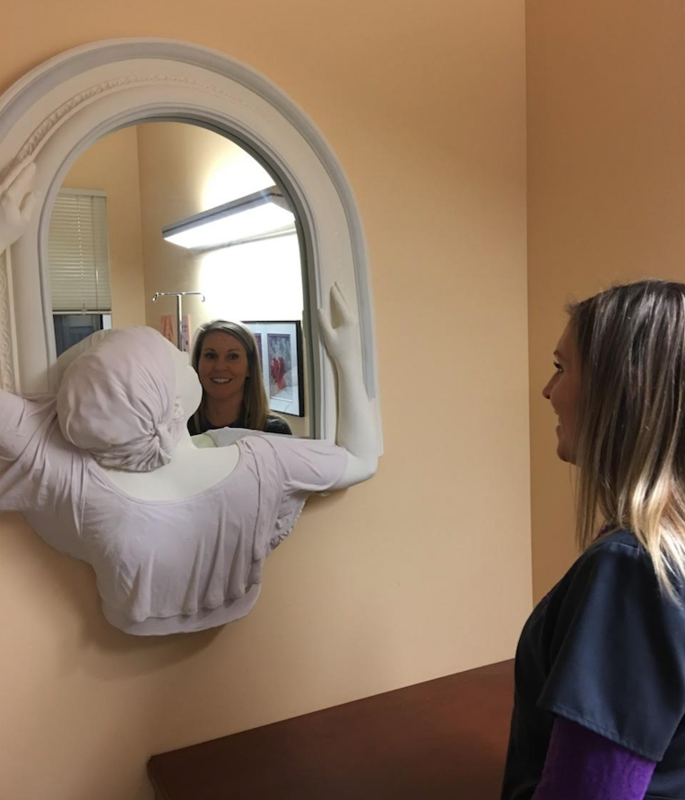 Fialkow’s Heartwell LLP is a practice comprised of 26 physicians, 10 nurse practitioners, and physician assistants—there are about 140 total employees across six offices. Fialkow has collected Warhol prints, a signed poster of Walt Frazier (the former New York Knicks great was a client), original prints by artist LeRoy Neiman from the 1960s and 1970s, and his own photographs from travels to Milan and Copenhagen. “I like to shoot things in their natural state, architectural design, and structures,” Fialkow said. While his wife is an interior designer who did the office design and furniture, he’s the art curator of the hallways and common areas. 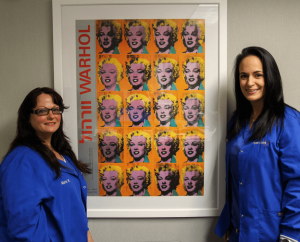 The artworks have an impact on Fialkow’s staff as they frequently bring patients from one section of the office to another to see various works of art. “I think it gives them a sense of pride that their boss takes an interest in their work environment, and it makes them feel more respected by us [the physicians] and pride in ‘this is where we work.’ Patients are sick and nervous, and our job is to reassure them. We want everyone to be comfortable,” Fialkow said. In his own personal office, Fialkow keeps a large photograph of Groucho Marx. “People can see it as they look through the door. It reminds me not to be too self-important; it makes me feel more human,” he said. 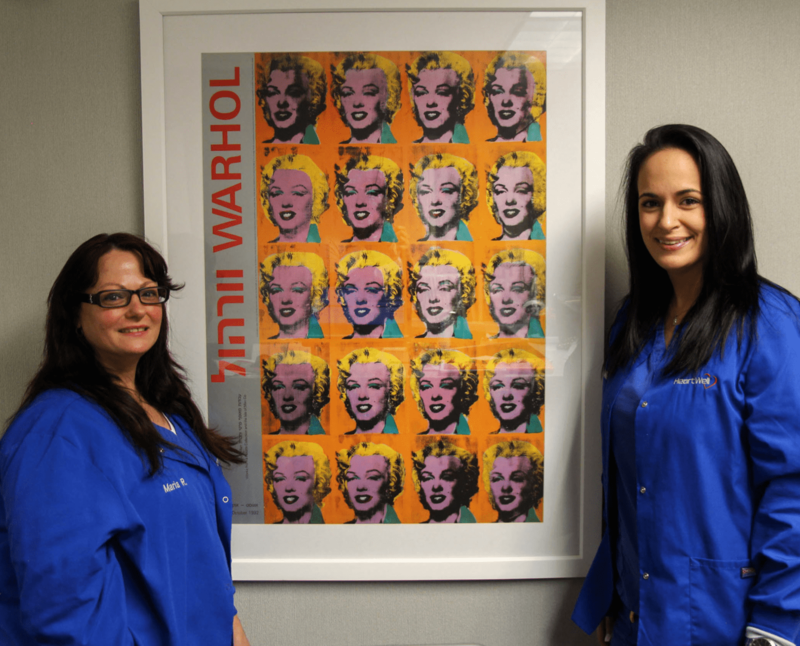 A limited edition Warhol print of Marilyn Monroe hangs in the nursing area. A homage to The Simpsons consists of a poster featuring the doctor and was given to him by one of his employees. Many of the artworks in the practice are photographs taken by him of iconic New York City locales—bridges in Central Park, an aerial view of the city from atop the Empire State Building, and crimson tulips along Park Avenue. Goldberg’s practice has a mix of paintings, a couple given to him by patients, lithographs, sculpture, and photography. He curated the look on his own. He bought a lithograph by the artist El Anatsui through a foundation, and it was the first print that the artist had ever made. Dr. Goldberg has bought art from galleries as well. He owns works by the artist Paul Chojnowski who creates detailed images such as a night scene of cars on a city street by burning paper. He showed a visitor a 600-year-old sculpture from the Tang Dynasty in his personal office. Dr. Bernard Bach, Jr., an orthopaedic surgeon at Chicago-based Midwest Orthopaedics at Rush (MOR), helms one of the country’s most well-respected sports medicine practices. A knee and shoulder orthopaedic surgeon, Dr. Bach is also team physician for the Chicago White Sox and the Chicago Bulls since 2004 and 2005, respectively. MOR is a group of private practices with 50 orthopaedic surgeons where art figures prominently, especially framed sports jerseys. In 2009, when the group hunted for a new facility, Dr. Bach volunteered to be on the art committee, and with a coordinator, they vetted art vendors. They estimated they needed 225 pieces of art for the main facility alone. They reviewed their needs with the Wilmette, Ill.–based H. Marion Art Consulting and reviewed catalogues to get a sense of what they were interested in. The office is set up into several color-coordinated “pods.” Each pod has three framed photos, and the central image is nature-based; all others are Chicago-related. One of Dr. Bach’s most unique pieces is a 4 x 6-ft. glass image of a shoulder x-ray. “We’re saving lives, we’re saving limbs,” Dr. Bach likes to say, so dynamic sports-related images are most important in the practice. There’s a LeRoy Neiman lithograph that was bequeathed by a patient and a lithograph of a tennis player. Not surprisingly, the practice has been gifted with sports jerseys from grateful high school, college, and pro athletes and their coaches. “I trained 85 fellows, sports medicine fellows, and what happens is they send us a jersey, signed by the coach or the physician we trained,” Dr. Bach explains. Plaques acknowledge each donated jersey—the practice has a total of 30 signed jerseys. “Personally, I love to do woodworking and glass-blowing. Some of my art is on the walls of the practice. And, in the pediatric area, there’s an area where walls were painted by an artist. One wall is an image of the White Sox baseball stadium, and the other wall shows spectators yelling and screaming,” Dr. Bach says. 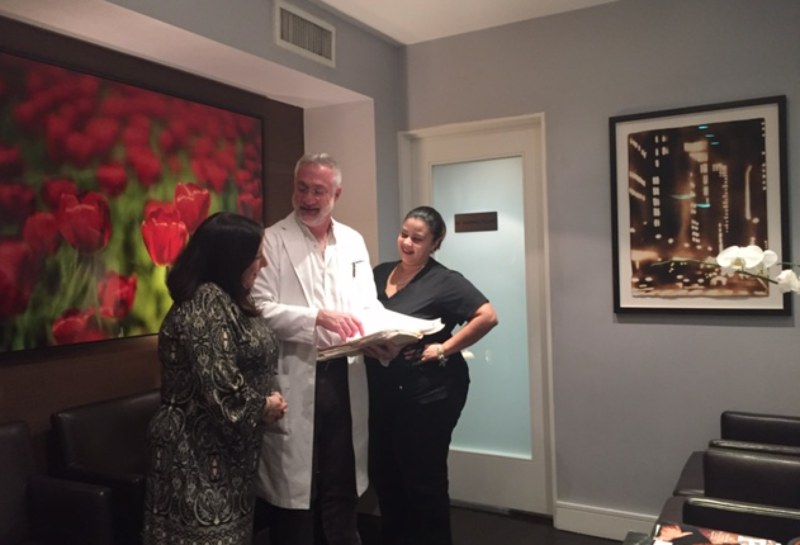 For Dr. Jon Mendelsohn, facial plastic surgeon with Cincinnati-based Advanced Cosmetic Surgery & Laser Center, art is just as much a source of passion as his practice. His eclectic art collection consists of a mix of pieces he’s bought at charity auctions, photographs he’s taken during travels to Africa (Maasai Villages, Arusha, Tanzania, Serengeti, and Rwanda), and commissions. “We’ve tried to focus on images of beauty, nature, human figures, butterflies, and landscapes. That being said, we also have pieces that are part of community efforts where children and other organizations were involved. 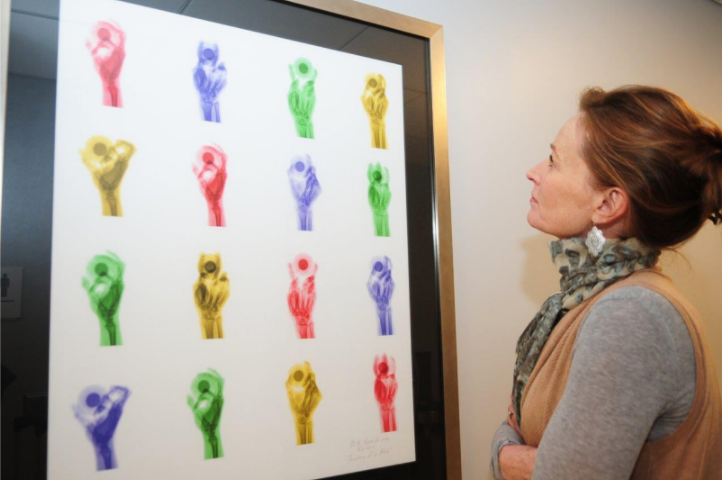 Often these pieces were obtained from auctions to raise money for charities,” Dr. Mendelsohn explains. Over the years, he’s worked with both collectors and interior designers. Currently, most of what he purchases are pieces from his travels, his own photographs inspired by those travels, and pieces from organizations raising money for charity. Dr. Mendelsohn’s love of butterflies and the metaphor they represent—transformation and metamorphosis—led him to form the Butterfly Project Foundation in partnership with Happen, Inc., which supports arts education for kids in need. He has commissioned pieces for the practice through the Foundation by local artists. A brightly colored painting of houses was painted by an artist that Dr. Mendelsohn’s foundation supported in conjunction with Project Connect, an organization that helps provide school supplies to homeless children. “The children painted this with the guidance of the local artist. We bought it at an auction we sponsored not only to further support the cause, but also because I just really liked it,” he says. A pair of bright and cheery yellow paintings was created by an artist who works in France as a commission. The raison d’être for a medical practice is to provide patients with an experience that inspires living stronger and healthier. Art is a great source of inspiration, and the experience created by art in a medical practice can have a profound effect in physicians, staff, and patients. Great art stops patients in their tracks and starts unique conversations with the medical team. What we see or hear in a painting is the recognition of what we all have inside ourselves, and art opens doors to new ways of encouraging patients to reach out about their care. Tobi Elkin is a veteran content creator and consultant who enjoys crafting compelling narratives for diverse audiences. Based in New York City, her writing has appeared in newspapers, magazines, and on websites including Advertising Age, AOL, the Associated Press, CMO.com, Narratively, Robb Report, The Huffington Post, and many others. She has consulted on thought leadership, marketing, and content strategy for technology firms, consumer brands, and non-profit organizations.